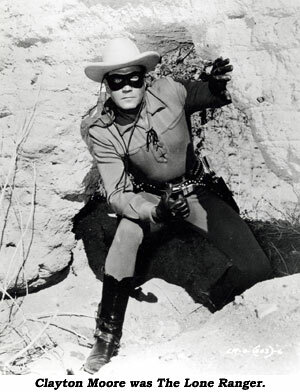 Will Hutchins remembers Clayton Moore--The Lone Ranger. Bleary-eyed adioses all around. I staggered to my orange VW beetle, Julius—wouldn’t start—Ach! Broken fan belt… Later, a sporty fellow in a blue checkered suit and cap chanced by. “May I help?” he warmly asked. “Thanks, pard, but I just called Triple A.” Off he went into the darkness with a reassuring smile. Who was that unmasked man? Could it have been the Lone Ranger in mufti? He didn’t look like the Lone Ranger. Didn’t have his hero’s bearing. Didn’t have his deep, stereophonic voice. I reckoned he was Clayton Moore after a job o’ work. Clayton, if we ever meet again I know you’ll be up on Silver, in full regalia, Tonto by your side—no wrap-around glasses. I raise a flagon of sarsaparilla (with a dash o’ cherry) in your honor. Ti-ye, Kemo Sabe!…By gad, sir, you are the Lone Ranger!